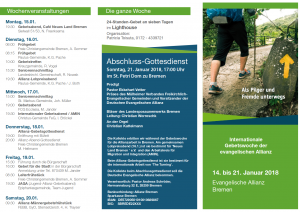 From 14th to 21st January the Evangelical Alliance Bremen will hold a week of prayer. In many events throughout the week the churches of Bremen will come together and seek the Lord in prayer. IBC Bremen is part of the Alliance and we encourage you, our members and visitors, to make time and participate. Detailed information about the events is provided on the Alliance website and in this flyer (German only).